Born: 29 April 1872, Glasgow, United Kingdom. Charles William Alexander was educated in Scotland and, after arriving in Natal in December 1887, at Maritzburg College, Pietermaritzburg. He entered the civil service of Natal in March 1895 and in October that year was appointed as first clerk in the resident magistrate's office in Eshowe. 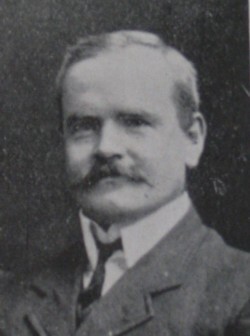 In September 1899 he was transferred to the government's audit office as second-class clerk, and promoted to inspector in the audit office in March 1905. In August 1910, after the formation of the Union of South Africa, he became provincial auditor of Natal province, then deputy-commissioner and inspector of inland revenue for the province in June 1911, and in February the next year receiver of revenue in Pietermaritzburg. On 27 July 1896 he married Lucie Peachey, with whom he had three children. Alexander's hobbies were entomology, photography and horticulture, but his most significant contribution to science appears to have been in shell collection. Like his friend Henry C. Burnup* he made frequent trips to the coast to collect marine shells. His finds included new species of the genera Triphora, Cerithium and Priotrochus, which were named in his honour, as well as the new genus Alexandria (later renamed Alexania). He also collected land snails. It seems that he had a light-hearted attitude to life, for on one occassion he sent a postcard to Burnup with a delightfully humerous verse describing his failure to find a specific species of snail. Shortly before his death his collection passed into the hands of Burnup and William Falcon*. Natal [Colony]. Civil service list, 1906.